Get the Low Maintenance Deck Your Family Wants from Local Deck Builders in Oakville. Your large property deserves an equally large, impressive deck. Builders in Oakville can’t always provide the personal attention, low maintenance products and green approach you want. When you family chooses Your Deck Company, they get a team focused entirely on bringing your outdoor living vision to life. We only accept 1 project at a time and focus on quality. Get the outdoor living space you want, at home or the cottage, this year. You didn’t just buy the house or the cottage, you bought the whole property. It’s yours to change, improve, and expand. Build a multi-tiered deck to cook and entertain overlooking the pool, or build a hot tub deck with a protective pergola beside the lake. What does your dream deck look like? Click below to get a little closer to it. Deck builders in Oakville, putting quality first. If you’re considering a low maintenance deck and looking for personal attention from concept to completion, contact Your Deck Company. Love it or List It. Tori & Dean – Cabin Fever. Or visit the gallery to see recent deck builds for families just like yours. When you’re ready to talk about your vision, book an appointment and get started today! We want to be your deck builders in Oakville. Yes, send me free tips on decking ideas for my backyard! Give your family the perfect deck. Start with this guide. 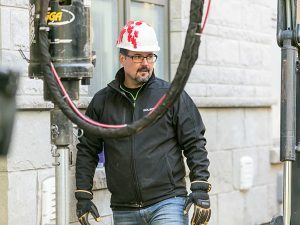 Helical Screw Piles – Ensure Your Project Meets the Building Code. 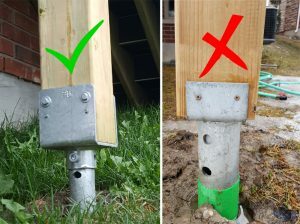 Helical Screw Piles – What are they and what do they do?